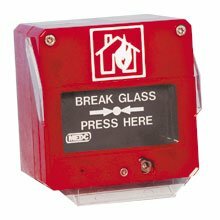 This manual fire alarm call point is designed in accordance with the latest draft European Call Point Standard (EN54-11). Weatherproof to IP66 and IP67 and available certified intrinsically safe, simple apparatus or uncertified, the units are manufactured from glass reinforced polyester (GRP) which provides a robust, corrosion free construction and ensures effective and reliable operation in harsh industrial and offshore environments. may be supplied to customer specification. ATEX Approved Ex II 1 G.
Designed in accordance with EN54-11. Optional in line/end of line resistors/diodes.